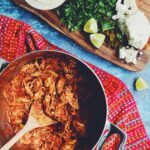 This spicy chipotle Mexican shredded chicken is perfect for tacos, quesadillas, and salads. 1 teaspoon oregano the mexican variety is best if you can! Heat a large bottomed pot over medium. Add olive oil, yellow onion and a pinch of salt and cook for about 5-7 minutes, stirring every so often, or until it starts to become translucent. Add garlic, cumin and oregano and stir; cook for 1-2 minutes until fragrant and toasty. Add in the fire roasted tomatoes, chipotle sauce, chicken stock, and apple cider vinegar and stir; simmer for 15-20 minutes until it begins to reduce. Use an immersion blender or a regular blender, and blend the sauce until smooth. Season with salt to taste. Add in shredded chicken and cook for another 10 minutes until the tinga sauce has absorbed. Season to taste again. Plug in your instant pot, turn it on saute and add oil. Add onion and a pinch of salt and cook for a few minutes until it becomes translucent. Add garlic, cumin, oregano and cook for another two minutes. Add in tomatoes, chipotle sauce, chicken stock, and apple cider vinegar and a few pinches of salt and stir. Add 4 salted chicken breasts on top of the tomato mixture then seal your instant pot. Cook on high pressure for 12 minutes then let it naturally release. Remove chicken breasts and set aside. Turn the instant Pot back on sauté and simmer the sauce. Stick an immersion blender in the sauce and blend until smooth. Meanwhile, shred the chicken breasts then place the shredded chicken back in the instant pot and cook for another 5 minutes or until the sauce has absorbed. You can make this recipe in an instant pot or on your stove top without changing any of the ingredients.